If you are looking for your first power toothbrush or you simply are a frugal person who wants to pay only for toothbrush features you are going to use every day, the entry-level power toothbrushes from Oral B – the Oral B 1000 or 3000 – look like a very attractive choice. OralB 1000 and OralB 3000 seem to be very similar models. What sets them apart and is it worth to pay twice as much for the 3000th model? Let’s find out and begin by checking the comparison table. 2.9 Which model should I get? 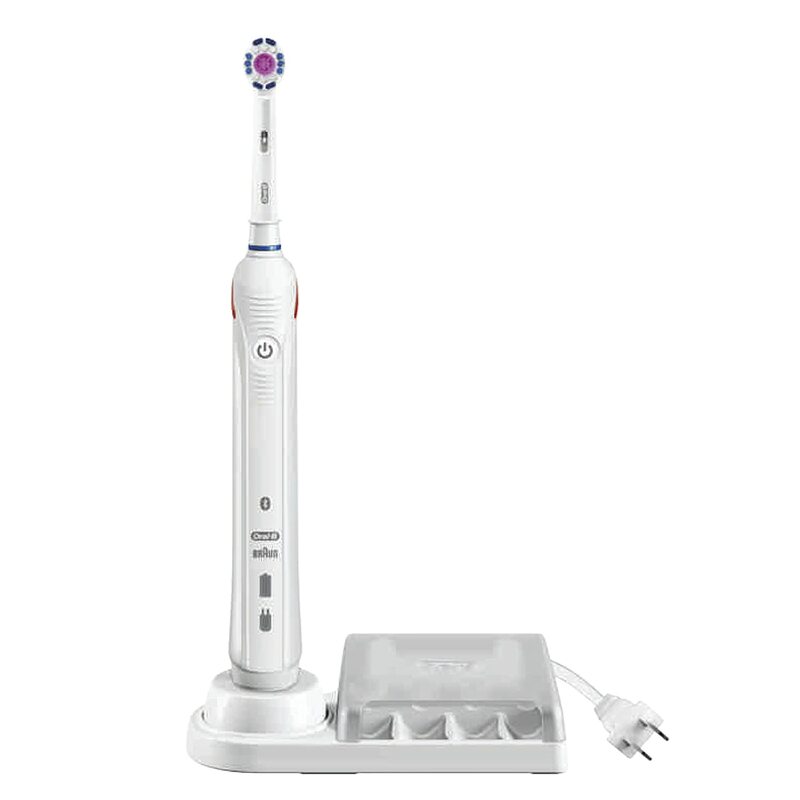 And I have also added the newer Oral B 1500 model to the mix. Review Read our review! See user reviews on Amazon.com! Read our review! It is important to mention that I will review the models designed for United States market. Oral B model range for Europe is slightly different. 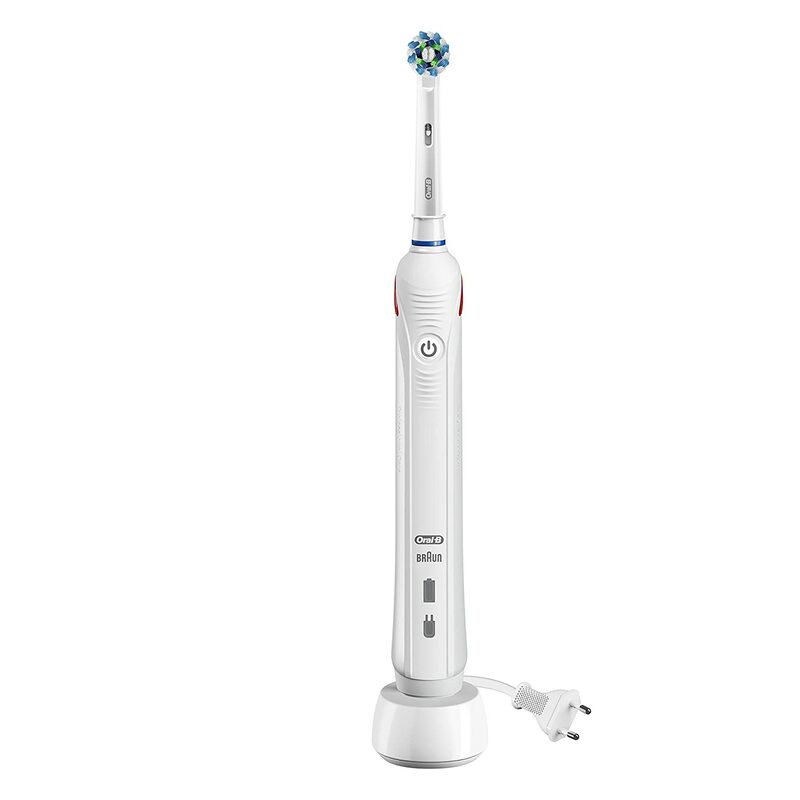 For example, the Oral B 3000 is called Oral B 3 3000 and has different specs. Let’s take a look at the differences between OralB Pro 1000 and 3000 brushes. OralB 1000 – only one brushing mode – the Daily Clean Mode. This is the basic cleaning mode built-in all Oral B models. I am pretty sure many users of more advanced toothbrush models have in fact never used other modes except this one. OralB 3000 – three modes – Daily Clean, Sensitive for gentle cleaning of sensitive teeth and gums, and Gum Care (replaced Whitening mode from older version) for extra care. I noticed that the manufacturer has replaced the Whitening mode but the brush is still supplied with 3D White brush head that is specifically designed to provide whitening effect. Does the 3D White brush head work equally good with the Daily Clean mode? That’s something worth investigating if you are planning to make your teeth couple of shades brighter. Both brushes use advanced OralB technology that is generating 8800 oscillations per minute. The difference is in a number of pulsations per minute. The 1000th model makes 20,000 pulsations per minute, and the 3000th model makes 40,000 pulsation movements per minute. Both models feature a pressure sensor that prevents from brushing too hard and damaging the tooth enamel and gums. This feature works differently in both brushes. In OralB 1000 the sensor stops the toothbrush as soon as it detects excessive pressure. In OralB 3000 the sensor will not stop the pulsations, but only reduct the brushing speed. You will see (hopefully!) the bright red warning light flashing the toothbrush handle. If you are using the smartphone app, it will also alert you about the excessive use of force. The long time Oral B toothbrush owners claim that it may take couple of weeks to get used to the brush and find the pressure balance. Then the sensor rarely gets activated. The manufacturer suggests testing the pressure sensor regularly by applying excessive pressure for a short moment. 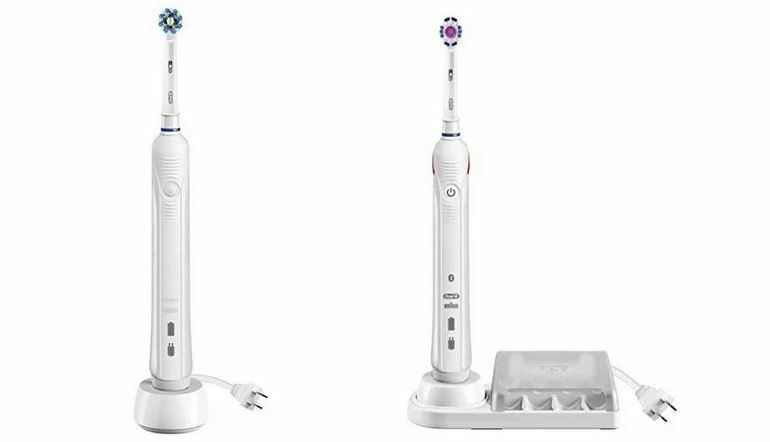 The latest generation Oral B 3000 features Bluetooth connectivity that lets it connect to your smartphone and provide assistance using Oral B app. Both brushes share similar design but Oral B 1000 features space-saving charger without brush storage box. Oral B 3000 is twice more expensive. Two minute timer lets you keep track of the brushing time, and the brush stutters every 30 seconds informing the user that is time to move to other quadrants of the mouth. These systems make sure you are brushing for 2 minutes just like all dentists recommend and spend equal time cleaning 4 zones of your mouth. Is it really all? Yes, it seems to me. Basically, there are 3 differences – 3 brushing modes vs 1 mode, Bluetooth connectivity, and app vs no app, and bundled brush head storage box. It depends if I want to pay a premium for the 2 extra brushing modes, brush-head box, and an application that will be fun to play with (for a while). That is really it. If you have sensitive teeth and you need this Sensitive brushing mode, you will most probably choose the 3000 model. If you think that you can live with only one brushing mode and have not intentions to play around with Bluetooth and smartphone app, save some money and get the OralB 1000. If you think you need information about other toothbrushes, go to our homepage for more details! Now it is time to find the differences between OralB 1000 and its younger but more powerful cousin Oral B 1500. The specs page on the manufacturer’s website claims that both brushes have only one brushing mode – the Daily Clean Mode. It looks appropriate because model name 1xxx means 1 mode. 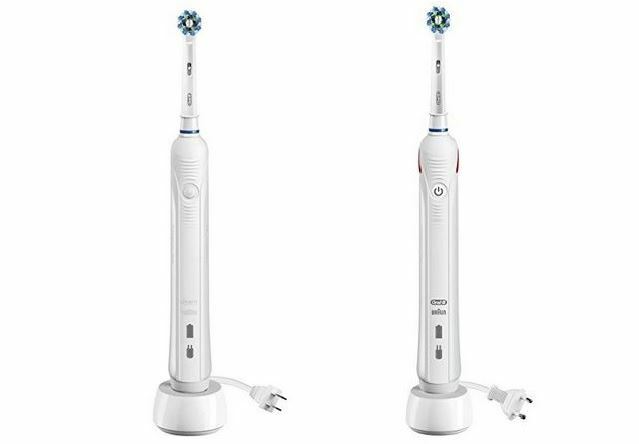 Then I checked the product page on Amazon.com here, several Oral B Pro 1500 users say that it has 2 modes – Daily Clean and Sensitive. I had to email Oral B to clarify this matter. They said that the users are actually right (doh!) and the brush indeed has two modes. As I have already mentioned above, the Oral B 1000 generates 8800 oscillations and 20000 pulsations per minute. The newer and more powerful motor of the 1500 model makes 9900 oscillations and 45000 pulsations per minute. Both packages have 1 toothbrush handle, 1 charging station, and 1 brush head – PrecisionClean for 1000 and CrossAction for 1500 model. 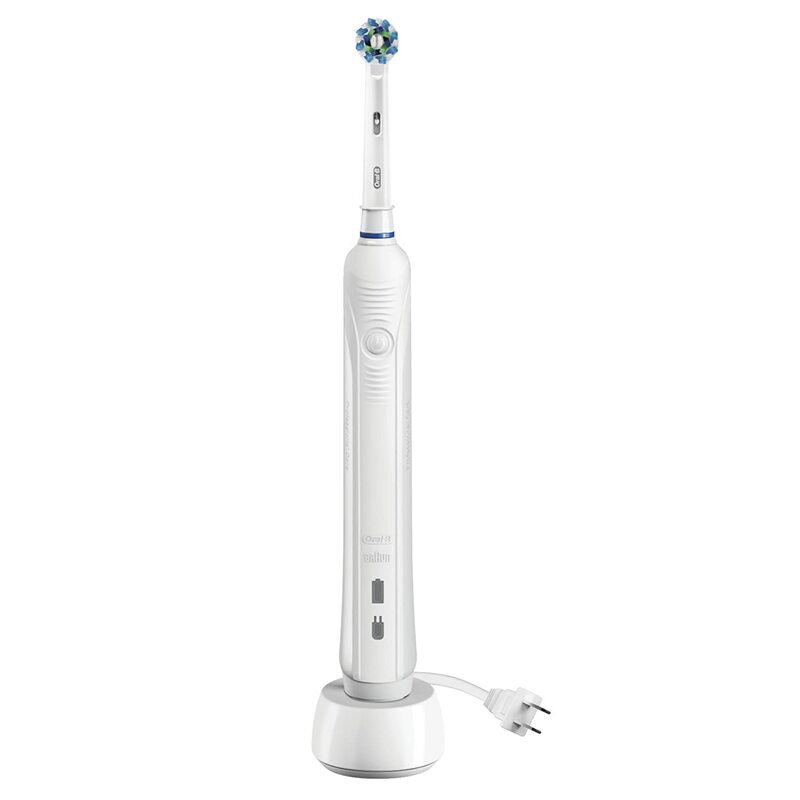 The newer Oral B 1500 features a Lithium-Ion battery that offers more uses between charging sessions. These models I discussed in this review are often compared with other entry-level Oral B toothbrushes e.g. 500, 2000, and 2500 models. I am working on an article explaining the differences between these brushes.